The central aim of the new Conservative-Liberal Democrat coalition led by David Cameron will be to impose savage cuts that will have a devastating impact on millions of working people. Its path to power was paved by the Labour Party. This is not only because Labour has acted as the defender of the super-rich for the past 13 years and gave a hated Tory party a way out of the political wilderness by depriving the working class of any means of political expression. In the most direct sense, Cameron was anointed as prime minister thanks to a campaign by a powerful section of the Labour leadership to sabotage the Labour-Liberal Democrat “progressive coalition” offered by Gordon Brown on Monday. With Liberal Democrat leader Nick Clegg having difficulty selling a coalition with the Tories to a section of his party, Brown offered to smooth the way to a Labour-Liberal Democratic alliance. This involved removing himself as Labour leader by September, once a coalition had been established, along with offering six cabinet seats, a bill introducing the Alternative Vote (AV) system and a referendum on proportional representation. The offer was clearly tempting to sections of the Liberal Democrats. Clegg is a member of the “Orange” group, formed in 2004 to argue for the Liberal Democrats to ditch their social liberalism in favour of support for the free market. He desperately wanted an agreement with the Tories, as did Vince Cable, his shadow chancellor, who left Labour to join the Social Democratic Party in 1982. But Brown’s offer was seriously and even warmly received by many top Liberal Democrats, including former leaders David Steele and Paddy Ashdown, who remember the explosive hatred engendered in the working class by the last Tory government. Brown’s proposal, drawn up in consultation with Peter Mandelson, Alastair Campbell and Lord Adonis, presented significant difficulties. With 258 MPs, an alliance with the Liberals and their 57 seats would still leave Labour without a majority. But Brown’s group calculated on the possibility of either bringing on board Northern Ireland’s Social Democratic Labour Party and one Alliance MP, as well as the nationalist Scottish National Party and Plaid Cymru of Wales not being prepared to vote with the Tories. The possibility of such a coalition was greeted with outrage by powerful sections of the ruling elite in Britain, as well as the financial markets, which believe that a Tory government alone will have the necessary political will to take on the working class. The past 24 hours witnessed a hysterical campaign by the pro-Tory media, led by Rupert Murdoch’s News International, denouncing Brown for “squatting” in Number 10 and the Telegraph describing Brown’s constitutionally correct actions as “A very Labour coup” (See “The Tory press and ‘democracy’”). At the same time there was significant trading against the pound, which fell by more than a cent against the dollar, while the FTSE 100 fell by one percent. In the end, however, the wishes of the ruling elite were imposed by leading figures associated with the Blairite wing of the Labour Party. Another former Home Secretary, John Reid, warned that a Labour-Liberal Democrat coalition would result in “mutually assured destruction” for both parties. Jack Straw, the Justice Secretary, was said to be “incensed”, while other ministers went to the pro-Tory press to denounce the proposal as “obscene.” Martin Salter, the former Labour MP for Reading West, wrote in theTelegraph, provocatively describing the Scottish and Welsh Nationalists and “the Irish” as “proponents of pork barrel politics”. Jon Cruddas, the backbench MP who is held up as a “left” in some quarters, staked his claim to leadership by saying that Labour MPs, “affiliated trade unions” and the party’s ruling National Executive Committee must be consulted on any coalition deal. An offer of a coalition from Scottish National Party leader Alex Salmond was unceremoniously rejected by Labour’s International Development Secretary, Douglas Alexander, who also automatically excluded the SNP’s ally, Plaid Cymru. The offensive succeeded, with Murdoch’s The Times declaring, “Labour infighting killed coalition hopes”. Throughout Tuesday, Brown was made painfully aware that he had been deserted by a large section of his own party leadership, who were intent on making his position untenable. That evening, Brown came out of Number 10 to announce his resignation as prime minister and Labour leader, effective immediately. After making an emotional statement, he departed in haste to Buckingham Palace to tender his resignation to the Queen. The main impact of his speedy departure was to leave the Liberal Democrats no other possibility than to accept a coalition with the Tories. He quit even before there had been any conclusion to the talks between the Liberal Democrats and the Tories and before any proposal would be put to the party by Clegg. 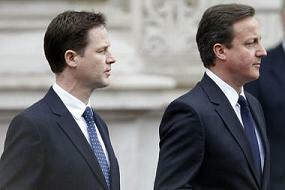 The way was cleared for the announcement of a coalition later that evening, with no details other than Clegg holding the position of Deputy Prime Minister. It is a measure of the undemocratic character of the Labour Party as a whole that neither Brown’s position, nor that of his Blairite opponents, was ever put before Labour’s membership. The parliamentary party only met for the first time today. Cameron and Clegg have brought their parties together solely in order to carry out the dictates of the banks and major corporations. They plan measures of unprecedented austerity, with millions thrown out of work, the destruction of vital services such as education and health and millions more plunged into poverty. In this they will have the full support of the Labour Party. In the next weeks, a leadership contest will take place within the Labour Party, during which the various right-wing challengers will describe their decision to oppose a coalition with the Liberal Democrats as “sensible”, “democratic” and providing for a period out of office in which to “reinvigorate” and “regroup”. It is nothing of the sort. The Labour Party put the Tories in power because it agrees with the Tory agenda and accepts the injunctions of the markets that Labour is no longer the favoured political vehicle of the financial oligarchy. There is nothing they will not do to win back this support. To this end, Labour will back up every attack that will be made on the working class—either by voting for them, or working with the trade union bureaucracy to suppress any opposition that emerges. Labour is not the party of opposition, but an undeclared member of a de facto government of “national unity”, just as surely as if it too had been directly involved in a coalition with Cameron.